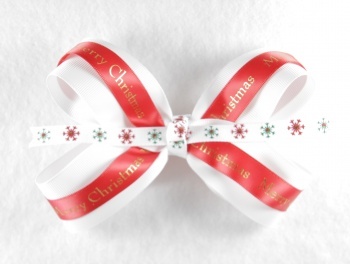 Wrap her up with this Merry Christmas White and Red Bow. This is a double layered bow with a brilliant white base bow that is topped with a red satin 5/8" ribbon that has "Merry Christmas" written in gold letters. There is a white grosgrain 3/8" ribbon with red and green glittery snowflakes streaming across. Spread your Christmas Cheer and match all your Christmas outfits.